VANITAS is another semi-conscious descent into the liminal territories between contemporary composition and electronic erosion. I am still consumed by landscape, by memory, by *that* sense of longing. And I still cannot stop staring at the moon. For this release, I played many more acoustic instruments than is usual for me. Piano, guitars and bass mostly – but also a series of virtual instruments that I built for the recording; sampled wood burning stove, tuned martini glasses, e-bow autoharp, stolen French music box, loose piano string droner, and a blow torch treatment of glass sheets. I also took my first leap into sonification resulting in the opening track; Invocation, in which I programmed NASA information about a particular lunar eclipse early in the 16th century, which I mapped onto a series of 6 solfeggio frequencies. I don’t necessarily subscribe to the mystical qualities accorded to these frequencies – but there is something undeniably affecting about them. The track clears the deck s very effectively for the remainder of the recording, I think. Hopefully these exploratory excursions don’t detract too much from what should be an immersive listening experience. 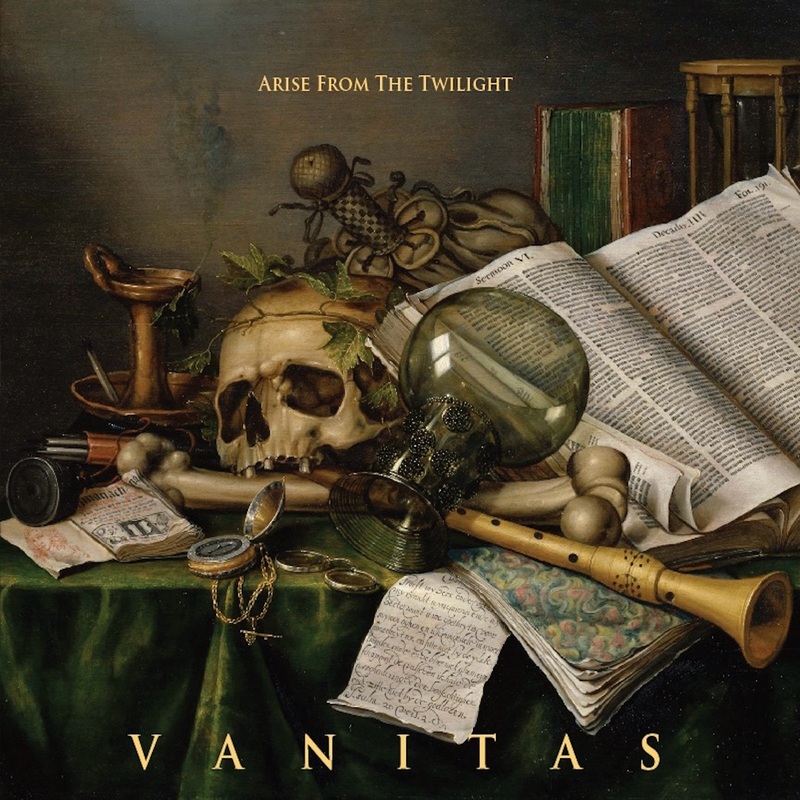 VANITAS will be available from May 6th on the usual digital download and streaming sites. But there is also a very limited CD run comprising 150 copies. As with previous releases, this comes in a hi-gloss, Japanese Artboard digipak. It also features a Deryk Thomas painting on the back cover which may surprise you! How I wrote up Vanitas at the end of the last session. Midnight. Orchestras are tuning up in the verges of the hollow ways. I have built my own instruments from wood, antique metals and computers. I read a book about the harmonic consonance between planets – but the planets are all out of kilter. I see through holes in the past that manifest as chasms in the sky. I am so sad. I am so angry. This is my only voice. These are my only tools. I sit still. Very still. I jump in time, but I always land in the night. The beautiful night. God, I cannot tell you how much I miss the night. Yes, i meditate. It seems very obvious to me that these pieces come from that space, that place – but it doesn’t warrant any closer examination than that. Just, please, allow the seconds to decouple themselves from the minutes. Watch the hours drift up to that hole in the night sky. This recording is a monument to a certain kind of laudable failure. It is what happens when someone with no gift for programming writes scripts in Python and Max in order to consume data and make the moon and the tide sing. It’s what happens when someone with cheap tools and the ghost of a sound to realise gets out of his studio and into the workshop to make doomed instruments from all the junk in the village. It’s what happens when a man with no formal musical education takes it upon himself to score and orchestrate an ensemble. It’s where ‘I can’t do this’ meets ‘I must do this’. This is not creating something of worth from silence, this is more like recovering something once lost from the midst of a solid block of shapeless sound. The work is done. The coding is spaghetti. The instruments are broken; warped and ragged. Still, the moon sings in my ear. The machines in the studio haven’t been updated in over three hours so are obsolete. Yet Clea’s cello, formed in the year of Mozart’s birth, spins a silver thread in space and time. And so, another midnight. Wife and children sleeping. Another illustrated ruin in my hands. And under what skies? Out into the night. Close the coop, and put away the hens water. Look up. There is one word you need to find. And if you whisper the right word, it will carry beyond the dimmest star. Now, back to bed, little pilgrim.